Organization, security and comfort are focal points of a business trip. A great business backpack is a step in the right direction as far as those issues are concerned. It will have the capacity and compartments to help you stay organized while having the durability and ergonomics to ensure your contents are secure and that you’re comfortable during your business travels. 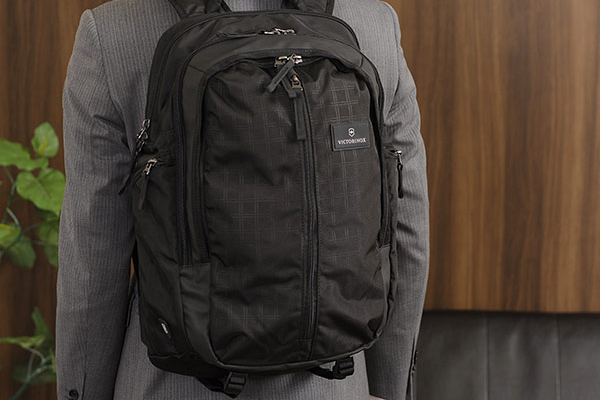 I’ve compiled a list of 10 of the best business backpacks for men. You can also check them out in more detail in our side-by-side comparison chart. 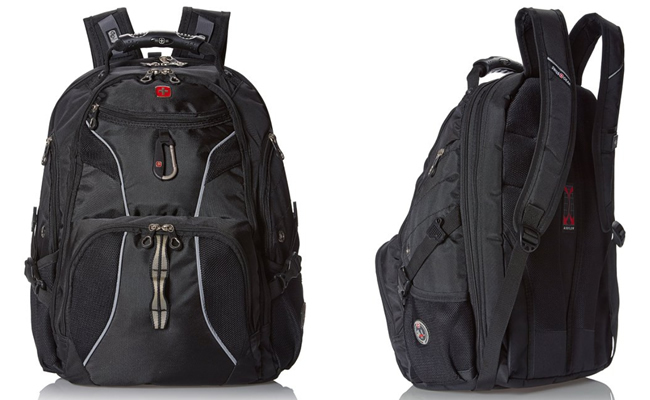 Affordable and versatile is what best describes the SwissGear SA1923 business backpack. Its appearence is a cross between business and adventure with its multiple adjustable straps and carabiner clip to hook onto keys, water bottles and other essentials. It’s not without an adequate amount of compartments though. You’ll find two lower side pockets with straps to secure bottles, two upper zipped compartments, two smaller front compartments that can hold accessories, a main compartment that has vertical dividers and a mesh pocket, and finally a checkpoint friendly laptop compartment. 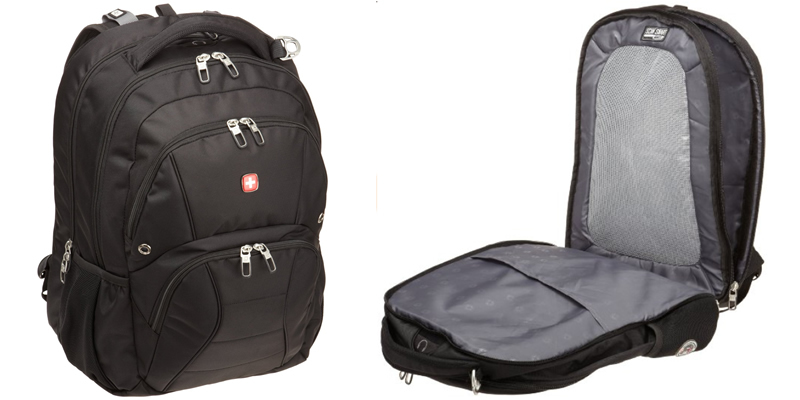 If you’re on a tight budget yet you need a multi-purpose business backpack, then the Swissgear SA1908 ScanSmart fits the bill. It’s the most affordable bag on our list but still packs a wide range of features including a checkpoint friendly laptop compartment with adjustable straps to accomodate different sized laptops, 3 other main compartments to seperate contents and an Airflow back system that allows better breathability. The Samsonite Xenon 2 offers a more refined and sleek design compared to many other business backpacks for men. Despite its clean look, it still offers a decent amount of compartments including 3 front sections, one of which expands outwards to reveal multiple pockets including a large tablet pocket. Though the real highlight is its large middle compartment that has enough room to store large folders, books and even a small stack of clothes. Opposite its seperate checkpoint friendly laptop compartment is a useful mesh pocket for any slim extras, offering the most for your business travels. As one of the few remaining bag manufacturers operating in San Francisco, Timbuk2’s bags are attractive and thoughtful. Their Command backpack offers business travelers a minimalistic design combined with simplicity. On first glance, it’s hard to tell where the front compartments are, but on closer inspection, you can see that they’re cleverly blended into the design. There’s a small zip compartment at the top for accessories and a larger one that runs vertically down the side. The middle compartment is the most spacious and it actually holds more than it looks. 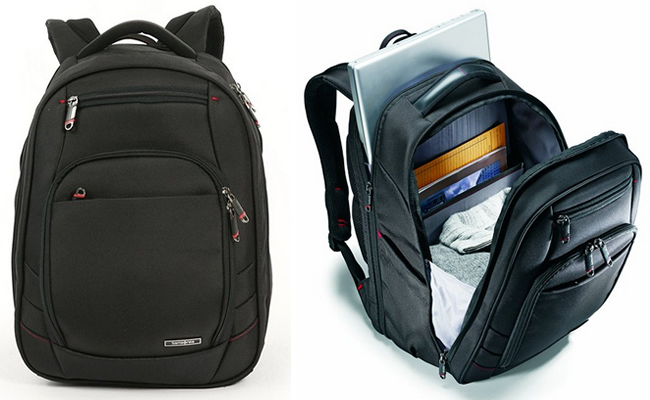 It also has a checkpoint friendly laptop compartment right at the back which sits smaller than the rest of the backpack. Compression straps allow the bag to be sized down when it’s holding less contents, so it feels like you’re carrying a smaller backpack. The Blue Ibex by SwissGear is not just a serious looking business backpack, it’s big enough to hold a large 17” laptop and durable enough to endure thousands of miles of travel over many years. 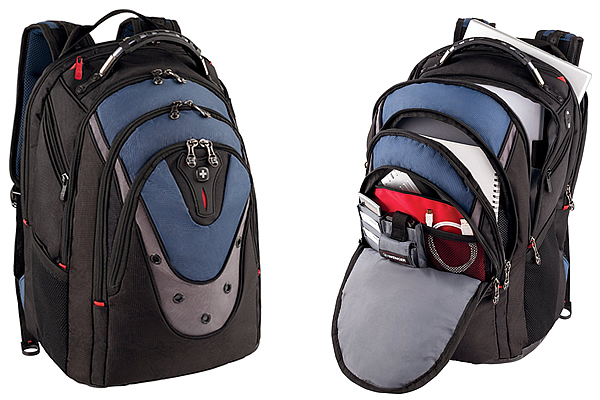 Its striking blue layered appearence distinguishes it from other men’s business backpacks. It has a decent amount of compartments though the side ones are a tight fit, but one of the main highlights of the Blue Ibex is its reinforced top handle which combines metal and plastic to create a solid handle. 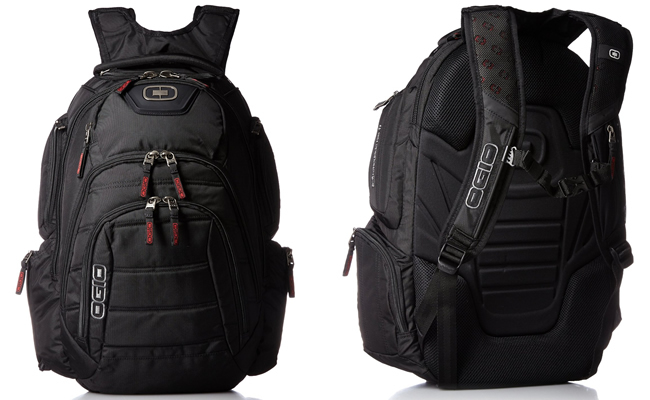 The metal zippers opens and closes smoothly, which cannot be said for many other backpacks. The brand KAKA is not as well known as any of the other business backpacks on this list, but that hasn’t stopped it from making a strong presence. 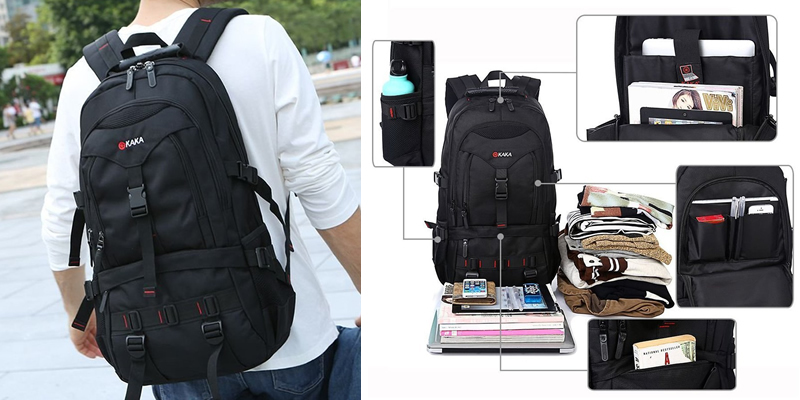 Thanks to its ability to hold a large laptop, secure compartments and superb value for money, this backpack has become popular for business and casual travelers. It’s sort of a cross between a business and hiking backpack. The two front compartments are divided into a top (has several pockets including one for a tablet) and bottom section (large enough to hold small books), both being secured by a flap cover with the top compartment having an extra buckle clip. The main compartment is where a large 17” laptop can be stored in a dedicated padded section. This compartment is also able to hold magazines, folders and other content. Of course, it’s secured by a buckle clip which can be tightened to make everything fit snugly and securely. Everytime you make a business trip, you’re going to be carrying valuable and invaluable belongings; things that are no easily replaceable such as documents and content on your laptop and hard drives/USB stick. The Thule Crossover ensures that these are kept as safe as possible with the backpack’s extra security features. 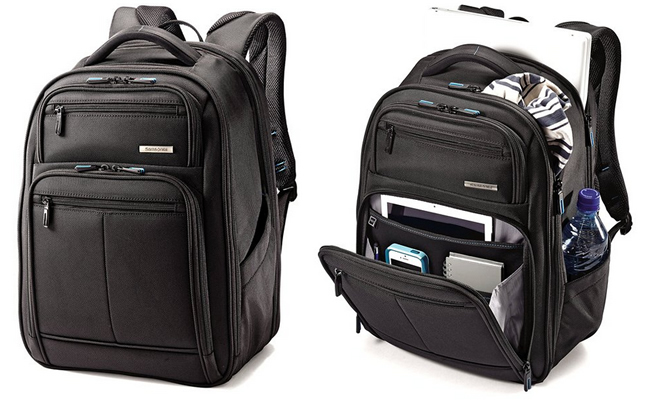 Despite it not having as much capacity and compartments as other larger business backpacks, it makes up for it by having a padded base which prevents damage to your laptop and tablet when setting the bag down, a removable crushproof section where invaluable portable electronics can be stored, and water resistant fabrics and zippers to prevent water from sneaking in. The Thule Crossover backpack is ideal for carrying a combination of technology and large documents/books due to its height and rectangular shape. It will do wonders for students, lawyers, attorneys and accountants. 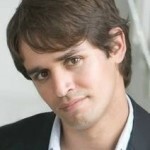 Oh, and it also looks the part. A worthy rival to the highly durable and secure Thule Crossover, is the Renegade by Ogio which prioritizes content protection characteristics and engineering over capacity and aesthetics. If you mainly carry electronics including a laptop, tablets, external hard drives, USB sticks and cellphones, then you’re in for a real treat. 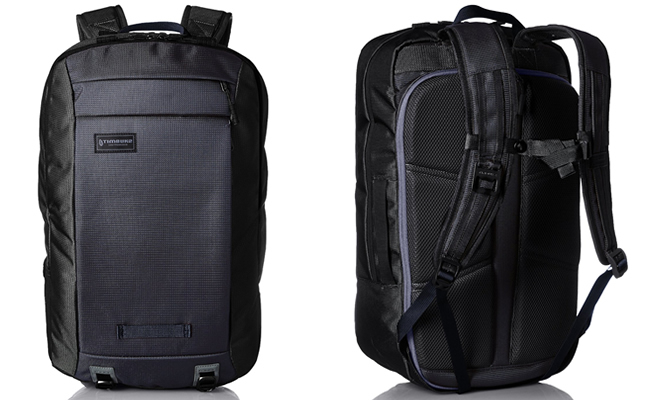 One of the highlights of this business travel backpack for men is its innovative Reactive Suspension System (RSS) that acts as a safety net for your laptop if you accidentally drop the backpack. It also has a crush resistant compartment to protect portable electronics, tear resistant exterior and is well padded throughout to protect all the bag’s contents. Despite its many security features, comfort is not compromised at all. In fact, it’s actually enhanced thanks to the Hybrid Unibody Backpanel (HUB) and increased foam padding within the shoulder straps. There are plenty of exterior pockets including a very handy quick access zipper pocket on the shoulder strap. 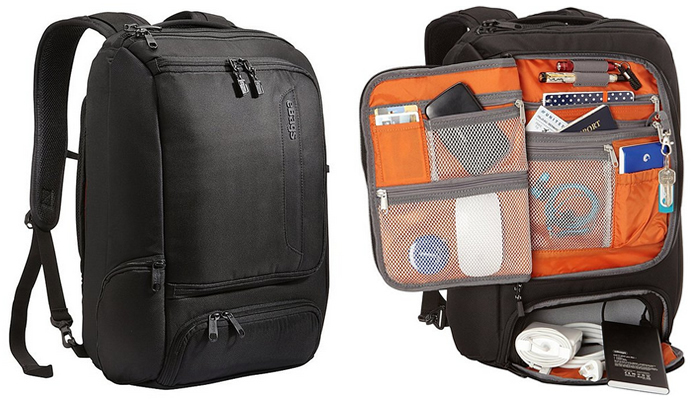 This backpack practically has it all for any business traveler. It’s very affordable, looks professional, compact and offers easy travel features such as luggage handle pass through and a checkpoint friendly laptop compartment. Those are just some of the reasons why the Samsonite Novex business backpack has proven to be so popular and highly rated. There are 4 exterior zipped compartments at the front, with the largest one having multiple pockets inside including one for a large tablet. Two side pockets makes bottles and other accessories easy to access while the large middle compartment holds a generous amount of documents and clothes due to the backpacks rectangular shape. Going through airport security is a breeze with the TSA checkpoint friendly laptop section that folds completely flat, and the strap at the back allows a luggage handle to pass through it, should you want to roll the backpack around instead of carrying it on your back. If you’re looking for a compact, sophisticated and affordable business travel backpack, then the Samsonite Novex is an excellent choice. eBags is a dedicated online bag retailer, and arguably the number 1 in its respective niche with over 26 million bags sold. They know a thing or two about bags, and their renowned TLS Business Backpack strongly supports this claim. 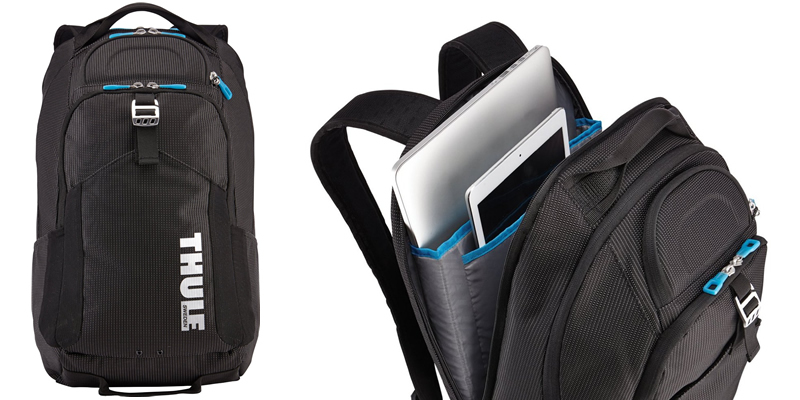 Organization, versatility and convenience are real highlights of this nifty backpack. Though it may not look like it, the TLS actually doubles up as a briefcase too, as it has a handle at the side so it can be carried horizontally too. There’s an opening beneath and on top of the bag which allows a luggage handle to pass through the entire back panel, decreasing the chances of the backpack tipping forward as it sits on top of your rolling luggage. Both these features serves as the ultimate convenience in business travel. If security is a concern, all zippered compartments are lockable, particularly the laptop and tablet compartments that feature a 3-way zipper lock design. Located at the bottom front of the backpack is the removable crushproof case that can store fragile and important contents. Open up the foremost compartment to reveal an array of pockets and slots to keep the most organized of businessmen happy. The eBags TLS Business Backpack embodies a clean and professional style yet has the functionality to serve any type of business travel. Plus, it’s covered under eBags lifetime warranty should you still have any doubts about the bag’s construction quality.